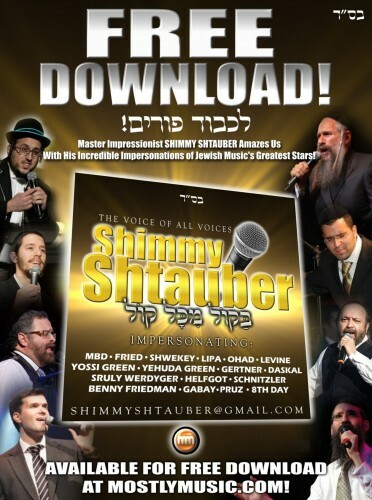 In the spirit of Chodesh Adar, master impressionist and talented singer Shimmy Shtauber compiled a collection of hits of all genres from the greatest Jewish music stars. 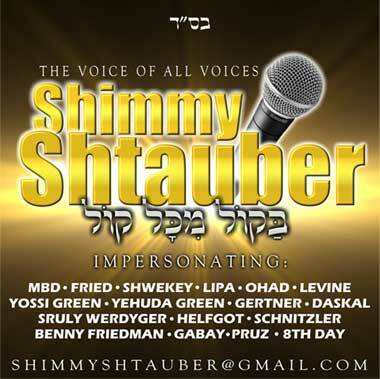 With incredible impersonations and great music, Shimmy wows us with impressions of MBD, Avraham Fried, Yaakov Shwekey, Lipa Schmeltzer, Ohad, Shloime Daskal, Baruch Levine, Yehuda Green, Shloime Gertner, Chazan Helfgot, Sruly Werdyger, Michoel Schnitzler, Dovid Gabay, Benny Friedman, Michoel Pruzansky, Yossi Green and 8th Day. This 16:30 track contains the action and excitement of an entire wedding in fast motion, including the first dance, dinner, second dance, third dance, and even a kumzitz at the end with Yehuda Green! 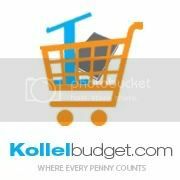 Download free and enjoy!